Guitar licks are the building blocks of solos. They can also be used as fills throughout a song. There are a myriad of common guitar licks and variations on those licks created by guitar players throughout history. Many guitarists can readily be identified by the types of licks they tend to use, almost like a signature. In fact, many guitar players have what they like to call their signature licks, or their go-to licks. Ace Frehley of KISS can be identified by his use of a heavy squeak and staccato picking caused by using the edge of the pick. Billy Gibbons’ solos can be recognized by the squeal of pinched harmonics throughout. There are lots of websites that have vast libraries of guitar licks tabs you can study to help you understand the licks that have built the songs you’ve loved listening to your whole life. Taking advantage of these guitar licks tabs and learning to play a range of licks can increase your vocabulary. A guitar talks in its own way, with the help of the guitar player, and the licks are its primary form of communication. The more licks you know, the better you will be able to speak with your guitar. Check out this example in the key of B. It’s a standard blues lick, one you may have heard a few times in a few different songs. It is a musical phrase that stands on its own, but in conjunction with several other licks, this lick could be just a small portion of a guitar solo or jam. Try playing this and them improvising a couple similar licks before and after to see what you can come up with. 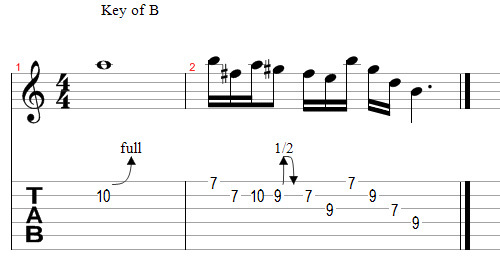 You might think o this lick as the starting point and build the rest of your solo around this single lick, or come up with your own lick that uses this as a supporting lick. I said earlier that a lot of players can by identified by the types of licks they play. This example below is similar to something that Jimmy Page would play stylistically, and if you examine the structure of the lick and compare it with some of Zep’s recordings, you’ll hear similar pattern used repeatedly. Playing a lick like this might suggest you’ve had a bit of Jimmy Page influence, but believe me when I say, Jimmy picked up the influence somewhere else. It’s how you interpret and change a lick that makes it your own. Guitar licks tabs are easy to find. Visit a couple of tab websites or check out Youtube to learn some of the most classic rock licks there are. The more you learn, the wider your vocabulary, the better your guitar playing.